This is one of the best-kept secrets of rural cycling that southwest China has to offer. Our GuiZhou to GuangXi GuiLin bike tour starts from the scenic Miao village of XiJiang, about 2.5hr drive ..
A classic and popular Tibet cycling/bike tour route, Across the Himalayas! This is another classic journey along the famous Tea Horse Ancient Route, where we do a sub-section from Shangri-la (ZhongDian) to LiJiang. You will cycle through deep countryside, valleys and gorges, along old backroads. option: private groups can customise the trip to.. This mountain biking adventure takes you on a full circuit arou.. This is a western Tibet overland journey that goes deep into the remote areas of Ngari (A-Li), up to GuGe ancient kingdom ruin.. This customised tour is created especially for travelers who wish to see the main highlights of China within a single journey of about 17days. Instead of the usual sight-seeing tours with unpleasant shopping components, SHANGRILA ADVENTURE operates this popular to..
Myanmar, the golden land, is another exciting destination in our cycling portfolios. We are the local Myanmar tour operator under our own new outfit ..
Apart of our fully-supported cycling tours, we also operate guided treks in our own backyards, in the Tibetan regions of western SiChuan (or East Tibet), also known as the Kham region. From short ..
QingHai-Tibet (QingZang) route, Highway 109, is one of the 5 main roads into Tibet. 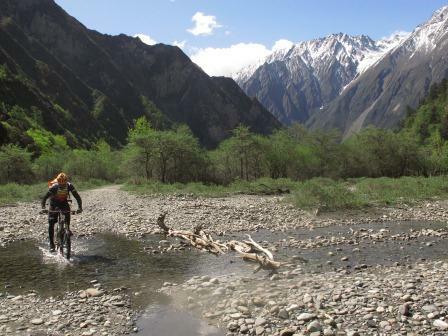 QingZang route stretches some 1160km, with an average altitude of 4500m, making it the longest and highest paved road.. This customised tour is created especially for travelers who wish to see the best highlights of southwest China.